According to Pew Hispanic Center estimates, the share of all legal foreign-born residents who have become naturalized U.S. citizens rose to 56% in 2011, the highest level in three decades and an 18 percentage point increase since 1990. U.S. citizenship confers a number of benefits on recipients. In addition to the right to vote, naturalized immigrants are eligible to participate in federal programs, gain a number of legal rights and become eligible for federal employment. The population of naturalized U.S. citizens reached 15.5 million in 2011, a historic high that reflects both a rise in the annual inflow of legal migrants and an increased likelihood that those who are eligible to apply for citizenship actually do so. The number of legal permanent resident admissions1 has exceeded 1 million annually since 2005, about double the annual number of immigrants admitted legally and granted green cards in the 1970s and 1980s (U.S. Department of Homeland Security, 2012). As a result, the total number of legal immigrants—naturalized U.S. citizens and legal permanent residents—has more than doubled in the past four decades, reaching 27.8 million in 2011. This has created a large pool of potential new U.S. citizens. 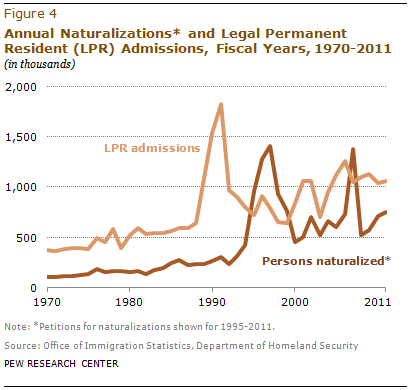 In 2011, a majority (56%) of all the legal immigrants living in the country had already become naturalized citizens. The rest—12.4 million—are green card holders who could eventually naturalize and become U.S. citizens. In 2011, naturalized citizens accounted for 39% of the 39.6 million foreign born living in the U.S., up from 34% of the 32.1 million immigrants in 2000. 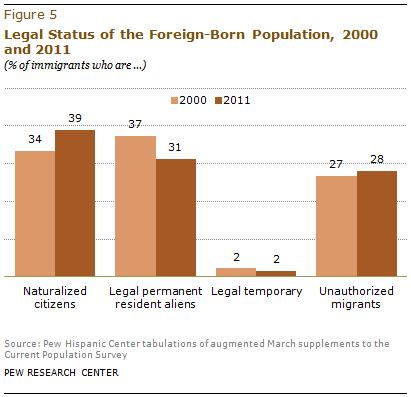 During this period, the share of legal permanent residents among the foreign-born population shrank from 37% in 2000 to 31% 2011. As of 2011, 9.7 million immigrants were eligible for naturalization but had not yet naturalized; of these, more than a third (3.5 million) were Mexican immigrants. 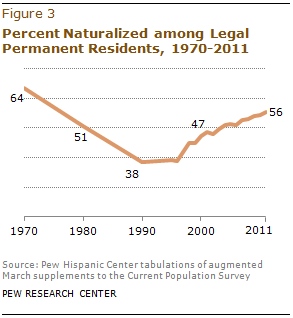 After a sharp increase in naturalizations of Mexican legal permanent residents in the late 1990s (Passel, 2007), the Mexican naturalization rate has flattened. 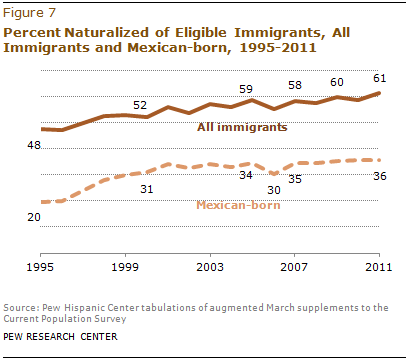 In 2011, Mexicans still had a comparatively lower rate of naturalization at 36% than the 61% for all immigrants and 68% for all non-Mexican immigrants. There are several possible explanations for these differences. 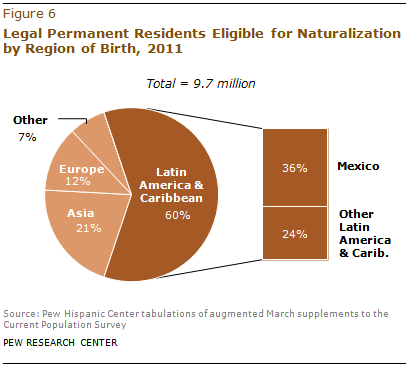 Most importantly, Mexican immigrants are more likely than others to maintain close ties to their home country because of the geographic proximity of Mexico to the U.S.
Another possible reason is that not all Mexican immigrants are aware that they can hold both U.S. and Mexican citizenship at the same time. Until 1998 Mexico did not allow its citizens to hold dual citizenship. The change in policy by the Mexican government is one reason the rate of naturalization of Mexican immigrants in the U.S. rose so dramatically in the late 1990s, from 20% in 1995 to 34% in 2001. Other possible deterrents for the naturalization of Mexican immigrants are the cost of the naturalization process and the difficulty of the English and civics test. In July 2007, U.S. Citizenship and Immigration Services nearly doubled the fee for naturalization processing to $595 and added an $85 biometric fee.